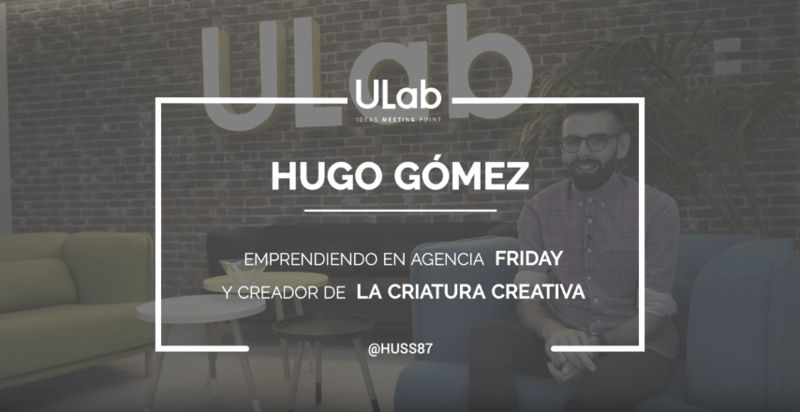 If you once visit our co-working center, it’s very likely you will meet Hugo Gómez, better known as The Creative Creature. He defines himself as a creative mind with full heart. Advertising, creativity, graphic design, and social media are his passions. He created the blog called The Creative Creature about advertising and creativity and has defined it as “the part of us that makes us solve problems differently”. He graduated in Advertising and Public Relations from the University of Alicante and has worked in different agencies as a Social Media Manager. He is one of Alicante`s most successful bloggers having won several prizes for his creativity. Two years ago he decided it was time to start his own agency and together with his partner, Itziar Tros, he launched Friday Communication Lovers which has its office in ULab. Both partners feel passionate about what they do; advertising and adapting the new online communication trends to their clients all while developing original, creative and innovative pieces of work. Q: When thinking about setting up a new business, what do you think is better, chaos or order? A: When we start a new business at the end it’s like a kind of chaotic order or organized chaos. You can’t be all order as, at the end, it would be very boring, yet you can’t be too chaotic either as you wouldn’t be able to work. I believe it’s impossible to live in absolute chaos. However, it’s true that you need a combination of both because and above all, publicity and creativity without a little chaos would be so boring! You need a little fun. Is Alicante a good place to be an entrepreneur? A: Many have people have asked me why I don’t move to Madrid or Barcelona to continue with my career. I always say that there’s a lot of movement in Alicante, many marketing events, etc. I believe this is the city where you can find the spirit and the inspiration you need to start a new business. Q: Pros and Cons about the success your blog has had. A: From my point of view, success is measured according to the goals each person has. As I see it, my blog has been successful for me as it has allowed me to do what I really love to do and this is the biggest Pro you can have: to do what you really love to do. There are also other Pros like the financial ones that help: people invite you to participate in events; they get to know you, etc. It has provided me a lot of visibility. The Cons could be that this work needs a lot of dedication and must be added to your daily work.